Integrated marketing communications … is it branding? 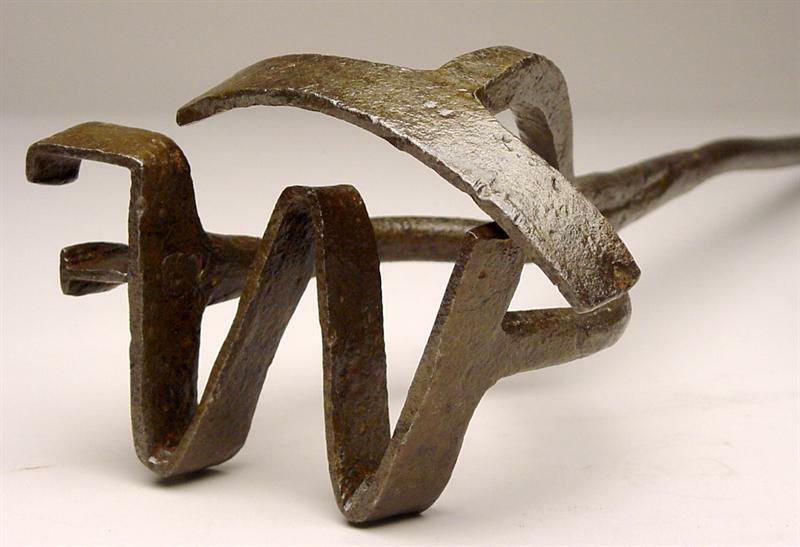 When I began in the design and marketing business, in the early years of Creative Company (1978 to 1988 or so), the term branding was used to describe hot metal applied to a cow. We pursued a process called integrated marketing communications. 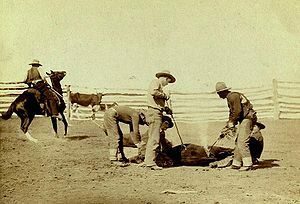 The original term “branding” referred to heating up metal in a specific shape (the brand) then applying it to the skin of a cow. On open range, the resulting scar identified (branded) specific cows as owned by those who owned that brand design. Ouch. Visual consistency demanded choosing a font system then using it and nothing else on everything from brochures to signing. It also required defining a color palette of PMS (Pantone Matching System) colors and their CMYK (Cyan, Magenta, Yellow and Black) builds for full color process printing. 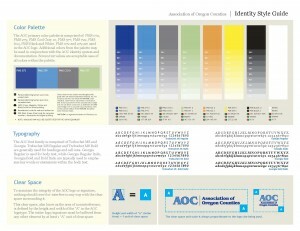 There was no need to define RGB or HTML colors or use web safe fonts. And really, fonts were spendy to buy and license. Photography was film, polaroids, time and many dollars. Reproducing color photos required costly color separations created on huge (and very expensive) machines. Full color printing meant four-colors on a press, sometimes one pass at a time. Then we progressed to two-color and four-color presses. Ensuring consistency meant standing over the press to check color saturation and match it to the swatches in a PMS book for the project. Smaller budgets avoided full color photos due to the high costs of reproduction. Yes, design and marketing communications were very different before computers came along. 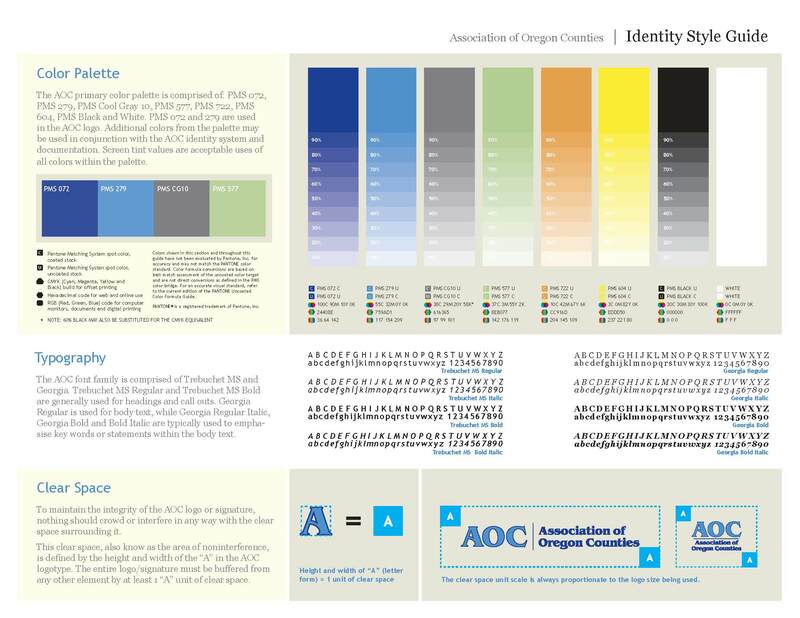 This is an example of a visual identity style guide, standardizing colors and fonts for an integrated marketing communications system … the visual brand. Yet that consistency visually tied marketing together. People knew at a glance who the communications were from. We built recognition for the companies we worked with. We helped them stand out wherever their message appeared. The integrated visual system created a personality. Those integrated marketing communications supported how they wanted to be known. Without that consistency, each marketing touch meant reintroducing the company. Follow up was less effective because there was no built-in recognition or understanding. With a visual system and consistent design standards, an effective integrated marketing communications system connected everything. That’s the first tenet of great branding — visual consistency. Creating an integrated marketing communications system was the foundation for today’s branding. Yet today, nearly 40 years later, the concept of brand has evolved much further. An article in Fast Company offers a quick summary — 10 Questions Every Brand Should Ask to Ensure It’s Simple Enough. Because keeping a brand simple and focused in this complex, multi-faceted, online and offline, constantly changing environment is tough, really tough. To build consistency, a brand must go beyond the visual (although it’s still vital). 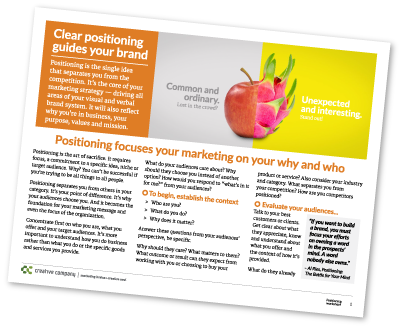 In our work we focus on positioning, purpose and people … then build a visual and verbal brand. The verbal brand is a defined messaging hierarchy to express the brand consistently. While we’re not ready to go this far now … though it’s likely coming … addressing the interactions your audiences have with your organization is essential to building the brand. If your audiences have a bad experience — a rude response on the phone; or a murky and confusing website; or a disappointing product and that doesn’t perform as promised–those experiences affect brand perceptions. That’s why the concept of “brand” must be integrated into the entire organization. It must guide the design of products and services. It must drive how they’re delivered and supported. The goal is to integrate the organization’s purpose into actions that fulfill on that purpose. And yes, a cohesive visual identity is still part of an integrated marketing communications system. There are many options when you’re branding … whether refreshing what’s in place now, updating and upgrading an existing brand system with fresh colors and fonts, (brand refresh) or reinventing how you’re seen, recognized and known. One thing is certain … your brand program will not consist of applying hot metal to cows. And to have impact, your brand must be built around visual consistency and encompass a verbal brand to express key messages and ideas. Include integrated marketing communications and tight and rigorous management over the customer experience to create that consistent, visible and memorable brand. Visit our website to see examples of new brands, brand redesign and brand refresh programs. These blog posts will give you more insight into the rebranding process. Rename and rebrand, ready to embrace the change? Our guide will help you decide if now is the right time to rebrand. Download it below. Thank you Jennifer, 30 years I’m working on industrial engineering I don’t know what the IMS , now a days I try to understand some additional information .